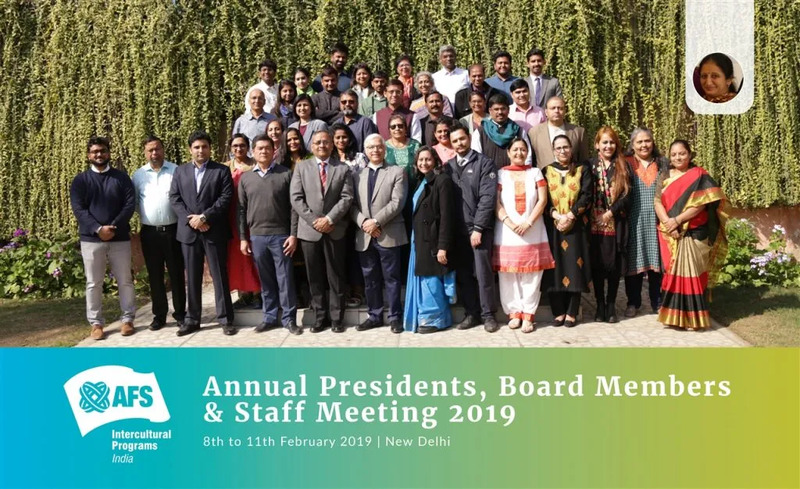 Annual Presidents, Board Members & Staffs Meeting 2019 took place in New Delhi from 8th to 11th February 2019 where 17 Presidents and 6 Board Members came together to discuss strategies and plan of action for the year of 2019. Highlights of 2018: The objective of the session was to share the journey of AFS India in 2018 in various programs and departments. The session was also aimed at acknowledging and showcasing the hard work done by the chapters, volunteers and schools through 2018. Highlights were shared with a special focus on unique measures, first time or large scale significant initiatives/contributions. Gallery Walk | My Chapter: This session was based on the preparation done by the chapter heads before they joined the Presidents Meet. Each of the chapter heads was given the task to prepare posters, powerpoint presentation etc. to showcase their chapter’s achievements, accomplishments and challenges of 2018. With the concept of gallery walk, each chapter was given 8-10 minutes to showcase their chapter growth, engagement and development. The session’s main objective to showcase the hard work put in by chapter volunteers in the last year and recognize their commitment to a bigger platform. Discussions between Board Members & Presidents with Staffers: This objective-based session provided a platform for board members, presidents and staffers to engage in a discussion and interaction. During this session, board members explored their role in the chapter towards creating chapter engagement and development. They learned how they can contribute more by being part of the chapter meeting, activities and events. Introduction to Workplace, Learning Module for Chapter Growth & updates on Elections: In 2019, new programs, activities and events are planned in accordance with AFS India and Network Strategy. Through this session, our aim was to enlighten and share the new developments in AFS India such as Workplace, Learning Module for Chapter Growth & Election. Leadership Development Program: A whole-day was focused on Leadership Development Program for Presidents. Participants engaged in the topic of how leadership is very important and how they must give time to learn how to be a better leader. Through the Incomplete Leader model, participants learned how they should keep on improving by learning new skills and talents so that they can create more awareness of AFS as an organization and advance its mission. The one-day program focused on providing an understanding and importance of Incomplete Leader. During the program, participants were asked to reflect in detail of the four attributes of the incomplete leader: Sensemaking, Relating, Visioning and Inventing. They were also told about the significance of communication and how it helps them to relate to 4 attributes. The program helped the participants understand that no leader is perfect; a leader doesn’t have to know each and everything; or should be able to resolve each and every query or challenges on its own; or have to come up with ideas alone to make a new plan of actions. A leader should be one who is continuously learning, asking help from others and keep reflecting on their strengths and weaknesses, and in that process, finding others who can help them overcome their weaknesses or the skills they lack. Operational Excellence: Operational Excellence session was designed to updates to Presidents on a few fronts of AFS India so that they feel empowered. A few topics that were discussed during the session were: AFS Mission Statement, Out Impact Goals from Network Strategy; Core Values and Attributes of AFS; AFS India Vision 2020; Volunteer Strategic Plan Vision; Chapter Meeting; Financial Chart 2019 etc. Plan of Action: Plan of Action aimed towards helping chapter heads realign their strategies and build a plan of action for 2019. Each of the Presidents worked with staff members to set their goals, activities, events etc. for 2019. Constant feedback and assessment were given by the staff to improve on the plan of action. Chapter heads also committed to the program numbers and volunteer development programs. Annual Presidents, Board Members & Staffs Meeting 2019 ended with a thank you note from National Director. Board Chairperson & National Director appreciated the Presidents & talked about the hard work they are putting in the chapter and how their advancement is helping AFS be a leader in volunteerism. We’d like to thank everyone for taking out time and being part of the Meet.